There has been a hospital on our site from the 12th century. After the Norman invasion of England in 1066, many monks were brought to England from Normandy to re-organise the Anglo-Norman church. One of their main influences was in re-building churches and cathedrals in the Norman style – Rye, for example. 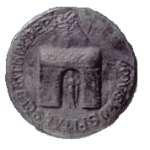 The leper hospital of St. Bartholomew was part of this programme, and was important enough to be virtually self-governing between 1189 and 1219. The order of St. Bartholomew came to England in the eleventh century and no fewer than 165 ancient churches and hospitals were dedicated to him. In 1290 King Edward I granted a charter for a fair and this fair, in 1305, was held on 24th August – St Bartholomew’s Day. 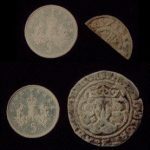 Between 1247 and 1415, possession of the hospital land sawed back and forth between England and France – every time an English king went to war with France, the land was ‘reclaimed’ by the English monarch. In times of peace, the King of England was of course happy to ‘return’ the lands to the French, naturally for a very large sum of money!! After Henry V’s famous victory at Agincourt, French tenure over the hospital lands was severed forever, and by 1435 the hospital buildings were in ruins. 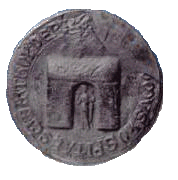 King Charles II, having regained the throne of England, quartered his troops on the Barrack Field in June 1666, and between 1779 and 1818, the land was commandeered by the Government. During this period it was regularly used as a base for troops. Rye was still an important cross-channel port, and many regiments were barracked there, in tented encampments on the site of St Bartholomew’s Hospital. A permanent Barracks Hospital was built on the site, and was still being used as a cottage in 1835. In 1844 a Work-House was built, housing 436 poor unfortunates, and this building became a hospital for the mentally ill which was operational as late as the 1980s. Artefacts discovered whilst building the new hospital. When demolition of the old Memorial Hospital began in 1994, the members of Rye Local History Group were invited to see if there was anything of historical interest on the site. 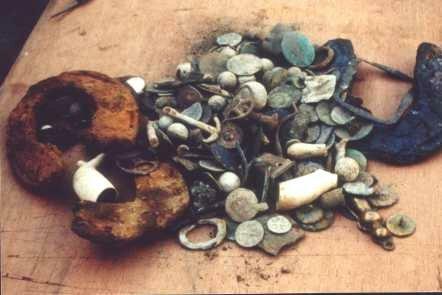 Given only a few weeks, in atrocious weather conditions, a veritable hoard of artefacts was excavated, including coins and pottery from the 13th and 14th centuries, and much military memorabilia, including officer’s wig curlers, spurs and children’s toy cannons! 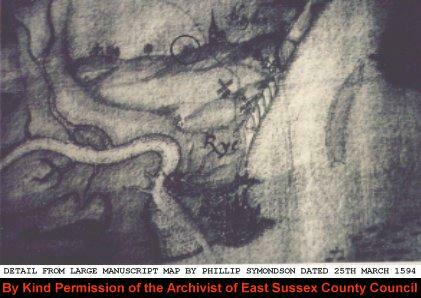 This work was carried out by the then Chairman of Rye Local History Group, Eric Wetherill, and Mr Peter Dooley, the Field Officer for the Group. 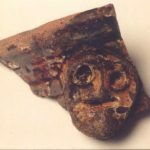 It was discovered that kilns for firing pottery had been on the site since medieval times, and pottery dating back 800 years was discovered. 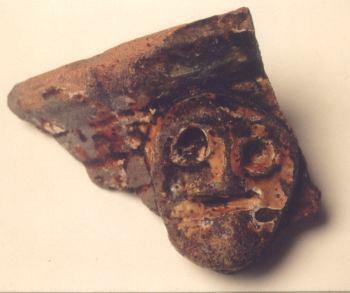 Among the many fragments found was this one, showing a decorative face, applied to a late 13th/early 14th century pot. 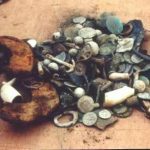 Without Mr Eric Wetherill and Mr Peter Dooley of the Rye Local History Group these artefacts would have been lost forever. And so would the old Hospital Bell … but that’s another story! There is a permanent exhibition of some of the Group’s finds at the Memorial Care Centre in Rye, and various publications which tell the full, fascinating story of the site. 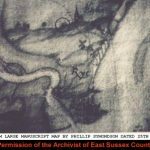 I am greatly indebted to Eric Wetherill for his help and advice and for the loan of some of his material, and to Allan Downend, Curator of Rye Castle Museum for permission to reproduce the sketch of the 13th of Foot encampment.